Spenótfozelék Bundás Kenyérrel | Creamed Spinach with Fried Rolls is a Hungarian food recipe flavored with garlic. Place spinach in colander to drain. Melt butter in medium saucepan. Add garlic and cook 1 or 2 minutes Be careful not to brown it, since browning changes the flavor. Stir flour and salt into butter mixture. Add 1 c. milk. Cook over medium heat, stirring constantly, until thick. Squeeze as much liquid as possible out of spinach. Add spinach to milk sauce in pan and mix well. Add black pepper. Cover and cook over very low heat about 10 minutes while making fried rolls. Cut rolls into ½-inch slices. Pour remaining ½ c. milk into a bowl. Beat eggs slightly in another bowl. In a medium frying pan, heat oil over medium heat for 1 minute. Dip both sides of roll slices in milk (do not soak) and in eggs and carefully place in pan. Fry each side 3 to 5 minutes, or until it begins to turn brown. 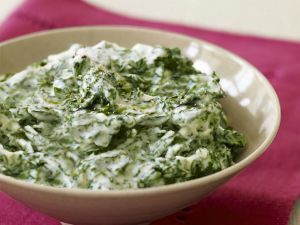 Serve immediately with creamed spinach.